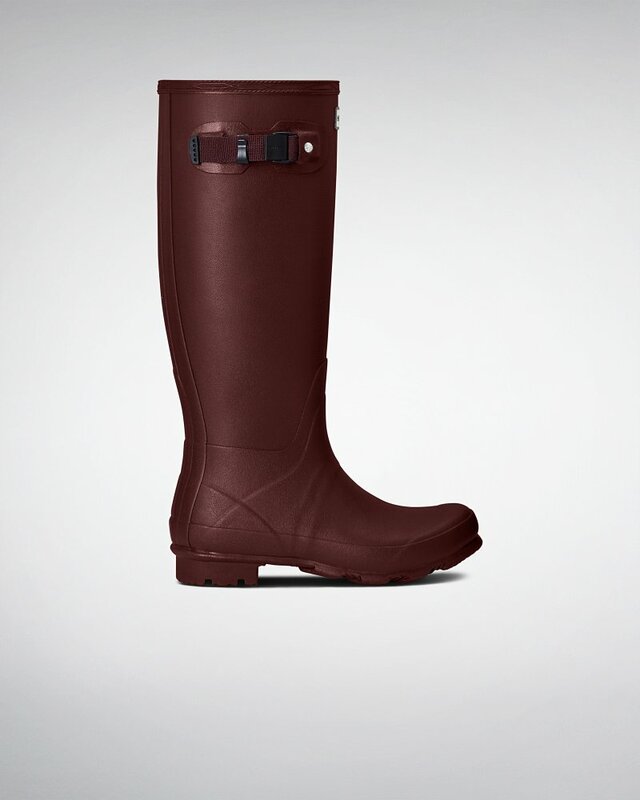 Women's Norris Field Rain Boots is rated 4.5 out of 5 by 54. De la fusión del modelo de diseño único de la bota alta Original con nuevos avances, la bota Norris Field está fabricada para un uso constante en distintos terrenos. La bota recibe el nombre del fundador de Hunter, Henry Lee Norris, quien creó su empresa de caucho en 1956. Fabricada con un nuevo compuesto de goma blanda, el diseño es fuerte y flexible, mientras que la duradera suela tiene una estructura en zigzag amplio para favorecer el agarre. Tiene una suela robusta con un tacón duradero y con un dibujo en zigzag de alta tracción, además de una hebilla impermeable y una correa ajustable. Rated 4 out of 5 by Cami from Durable boots Just bought these boots and they’re durable. Only thing is that I was hoping the inside had more cushioning to support the feet on the inside. You’re almost forced to buy the boot liner to keep your feet warm and cushioned in the snow. Rated 5 out of 5 by Anonymous from Warm and functional My mom bought me these because I hike dogs for a living. I got the fleece lined socks as well. I hike in them almost everyday. They are actually waterproof. I’ve walked through rivers and my feet stay dry and warm. They are my FAVORITE boot I’ve ever had. Rated 5 out of 5 by Dee A. from Simply The Best These boots are brilliant. A tall boot that fits like it was custom-made. Comfortable, moveable, and chic with just enough sportiness. Rated 1 out of 5 by Sarahbell1 from Not impressed I received these boots with from my boyfriend As a gift they were too tight in the calf, so I returned and ordered the wide calf.....it was way too big and too tall as I’m 5’3 they were almost over my knees and I feel like I’m swimming in them. I’m trying to find a pair that fit, maybe try the huntress next. I don’t live close to a retailer so I’m unable to try them on in person. This is so frustrating, I hope maybe I can find a better pair for my needs. Hopefully I can stop returning and swapping different boots. Rated 5 out of 5 by Jaycee from The color is gorgeous and the boot is great quality. I can tell they are going to pass the test of time. Rated 4 out of 5 by Marcia from These boots are great. Comfortable especially with my orthodontics in them. I do wish they were tighter around the ankle. I sometimes feel like I'm a clunker in them. Rated 4 out of 5 by Renee from nice boots. little tighter than expected at the top, around the calf. Not sure the adjustment straps are needed for me, when they start out fitting tight. Will wear mostly with leggings, might feel a little restricted in jeans. Quality and style is great, though. Rated 5 out of 5 by Dacey from After finally ordering my first pair of rain boots from Hunter, I am very pleased with the quality and appearance. I heard that the shoe size runs slightly larger than usual, so I ordered a 9. The boots fit perfectly with both thin and thick socks. The adjustment ******** the side is an added perk to customizing size and I can already tell that these boots are more durable than cheaper rain boot brands I have purchased in the past. I am looking forward to wearing these boots throughout all seasons, rain or snow.